A “blue wave” is slowly but surely sweeping through the hallways at Orangeville District Secondary School (ODSS) and principal Patrick Hamilton is hoping to see it spread even further into the local community in the new year. Having introduced the One Voice, One Team service group to ODSS students last spring, Mr. Hamilton, alongside faculty members Adam Vickery and Carmina Bradbury, have been busy coming up with ways for participating students to get involved in the community. With more than 160 students currently enrolled in the program, it’s safe to say it’s taken off in a big, big way. “One Voice, One Team is all about service to the community. It encourages students to make a better ODSS, a better community and a better world,” Mr. Hamilton told the Citizen. One Voice, One Team is the brainchild of Orlando Bowen, a former professional footballer who played for several years in the Canadian Football League (CFL). Launched in 2005, the organization aims to help empower youth to utilize their leadership skills and talents to better themselves and their community. Over the past 12 years, One Voice, One Team has worked with over 700 schools and engaged more than 300,000 youth. Mr. Hamilton was first exposed to the program five years ago when he was principal at Centre Dufferin District High School. He credits One Voice, One Team with bringing the school community together at CDDHS during what he described as a difficult time. Between the summer and fall of 2013, the school saw a “drastic change” in its student populace, with an influx of new residents. While there are no real issues of note Mr. Hamilton is trying to solve at ODSS, he believes One Voice, One Team is providing a platform for all students to get involved in their community, rather than just the usual suspects. Since the beginning of the school year, the One Voice, One Team group has been involved in various activities throughout the community. 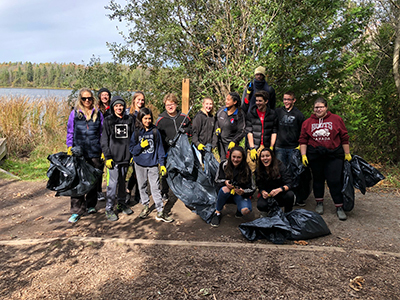 More than 50 kids helped in an Island Lake Trail Clean-Up in October, while 35 students participated in the Santa Claus parade. Throughout the month of December, One Voice, One Team hashelped with such things as the Salvation Army Christmas Hampers program, the Orangeville Legion’s Senior’s Dinner, a Christmas lunch for special needs students in the area and a Christmas toy sort. In the new year, the group will be helping with the Orangeville Food Bank’s Coldest Night of the Year fundraiser. Mr. Hamilton said the group will also be assisting with the Habitat for Humanity build slated for Dufferin County in the near future. One of those athletes is Grade 12 student Anyang Atem, a seven-foot tall basketball star. He has been involved with One Voice, One Team from the get go, participating in every single organized event so far this school year. Grade 9 students Julia Yates and Erika Buffett got involved with the program after attending an information session in September. Now, they say One Voice, One Team will be a focal point of their high school journey for the next three years at least. “I’ve always been really into volunteering. I like helping people, it makes me feel like I’m giving back to the community,” Ms. Yates said. After witnessing first-hand the impact One Voice, One Team can have on a community, Mr. Hamilton is keen to see the program grow into local elementary schools. His long-term vision would be to have every school in Orangeville operating under the Once Voice, One Team banner, helping to make a difference in the community. “This thing is really spreading. One Voice, One Team is becoming a hot commodity and I’d like to see it spread even in Orangeville. Our dream is to see it outgrow ODSS almost, to have 300 kids out in the community in their blue hoodies, serving the community,” Mr. Hamilton said. When asked how he measures the success of the program, he looks back on individual cases when One Voice, One Team has quite literally turned students’ lives around. For more information on One Voice, One Team, visit onevoiceoneteam.org.